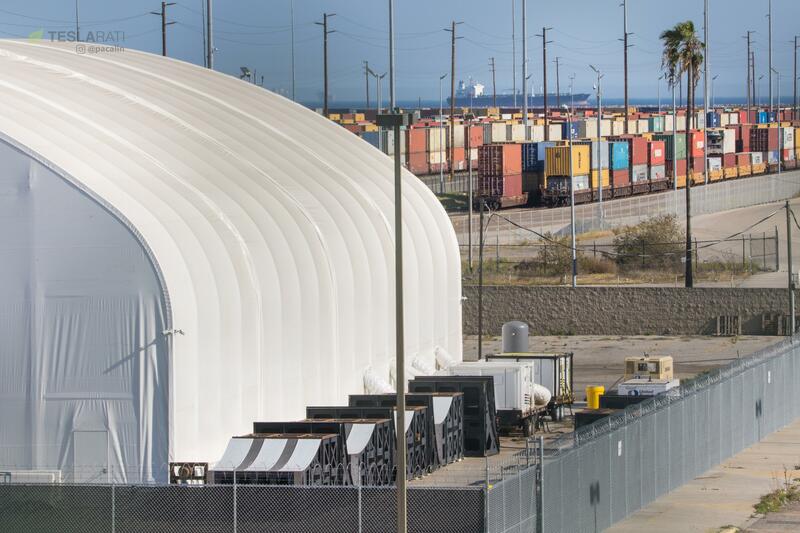 Photos taken by Teslarati photographer Pauline Acalin have confirmed that SpaceX’s massive Mars rocket fabrication tooling has been hiding in plain sight at the company’s Port of San Pedro tent facility. 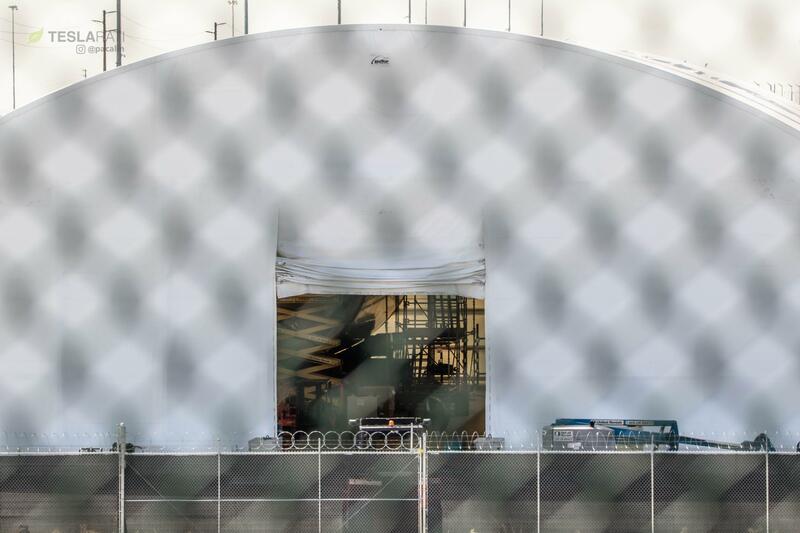 Spotted inside the temporary structure thanks to open flaps and a human desire for a breeze amidst the warm Los Angeles springtime, the main cylindrical component is truly vast – large enough that the eye almost glazes over it at first glance. 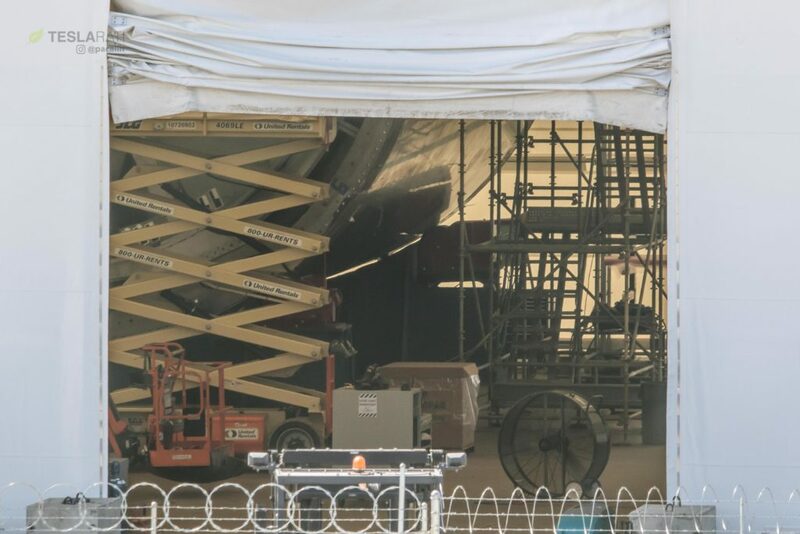 Dwarfing the humans clambering about it, very rough estimates using knowledge of the tent’s reported area (20,000 square feet) and size comparisons with machinery blueprints suggest a diameter of around 8-10 meters (26-36 feet), loosely conforming to the expected 9m diameter of BFR, as of CEO Elon Musk’s IAC 2017 update. Recently, however, President Gwynne Shotwell showed off an updated Mars rocket video at TED2018 that led to Musk hinting that BFR may have grown slightly since then. The massive cylindrical structure teased by Musk earlier this month is most likely a mandrel, a tool that can be spun on its horizontal axis to weave predetermined structures. In the case of the Mars rocket mandrel, it will likely be used to carefully wind dozens or hundreds of layers of carbon fiber (known as prepreg), interspersed with layers of laminate and various epoxies and resins. 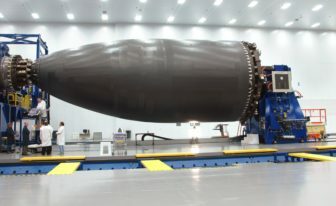 It’s also possible, however, that the massive tool is instead a multipurpose mold and autoclave, where the composite layers would be lain on the inside of the cylinder, allowed to set, and eventually sealed inside and heat/pressure treated. 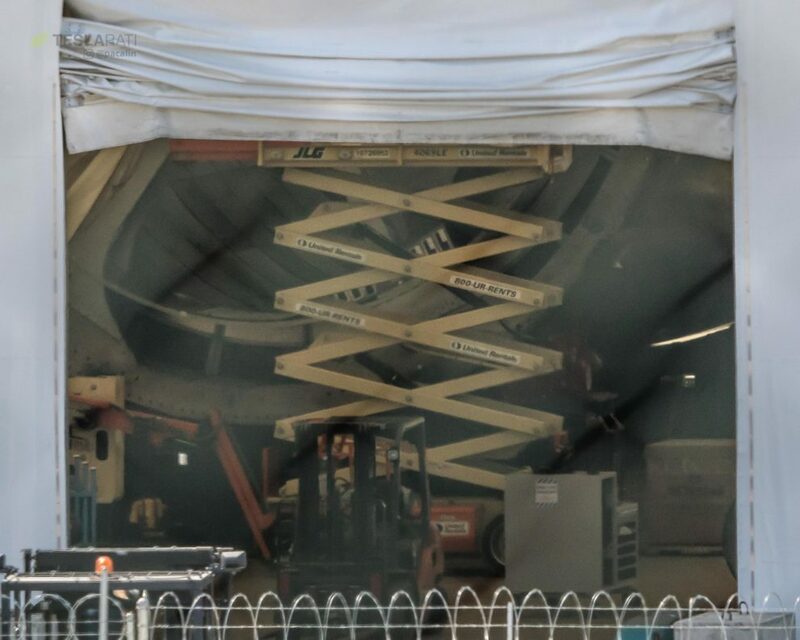 Images of the machinery are fairly ambiguous: they show a structure that could have connection points one might find on an autoclave, as well as what appears to be a thick and well-insulated internal wall. 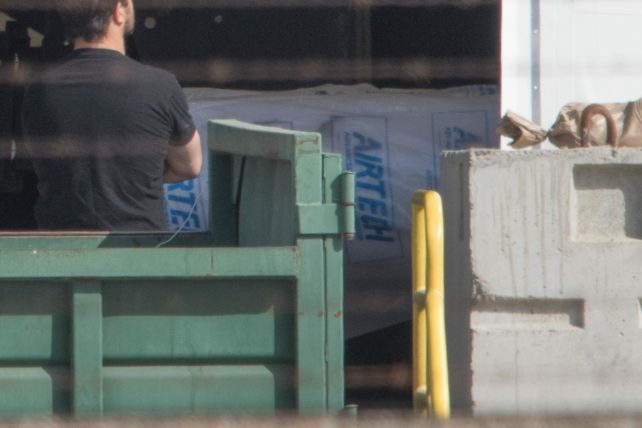 However, the external skin appears to be a relatively thin sheet of metal, which would point more towards a traditional composite mandrel, where certain sheets could be removed or modified as needed to create desired shapes in the composite while it’s being formed, less risky than machining a completed segment. 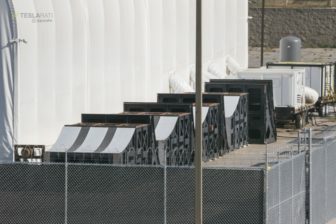 Perhaps even more interesting, a number of massive metal structures were spotted just outside of the tent. 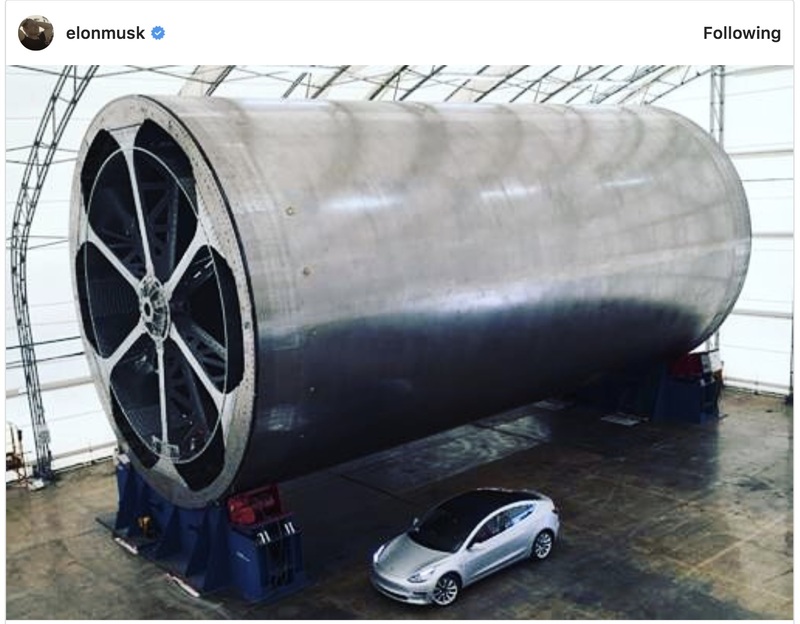 While it is unclear what exactly their purpose was, is, or will be, it’s more likely than not that they are components of a carbon composite mold or layup structure meant to deal with fabrication of certain Mars rocket and spaceship components with complex curves, versus the relatively simple cylinders that BFR and BFS are largely comprised of. 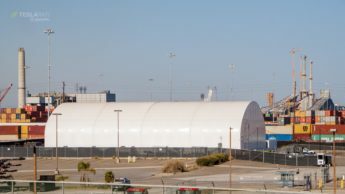 Still, precedents exist in large aerospace composite manufacturing for the fabrication of structures with complex curves, most notably the nose and front sections of airliners like Boeing’s 787. 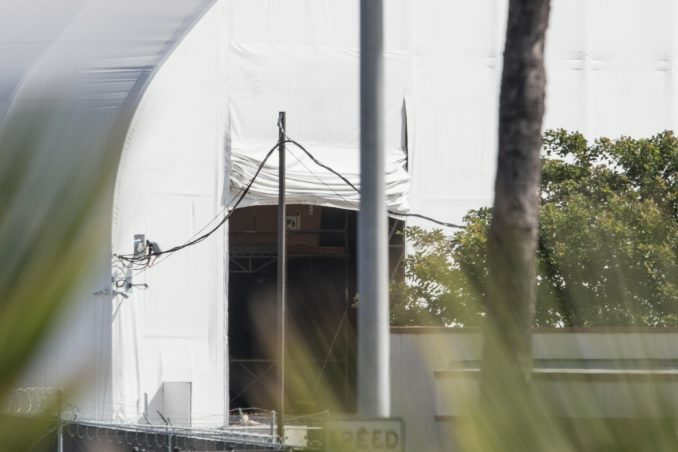 Finally, it’s worth noting just how shockingly busy the BFR tent was on both April 13th and 14th, as well as the 8th (the first day Pauline visited the facility). 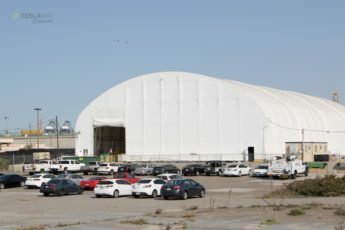 With upwards of 40 cars parked at the tent, it’s blindingly clear that SpaceX is not simply using the tent as a temporary storage location – alongside the arrival of composite fabrication materials (prepreg sheets, epoxy, etc) from Airtech International, SpaceX undeniably intends to begin initial fabrication of the first BFR prototypes in this tent, although they will likely eventually move the activities to the Berth 240 Mars rocket factory. That’s certainly not a sentence I ever expected to write, but it is what it is.